Daiju-ji Temple (大樹寺) is one of the Pure Land Buddhism Temple located in Okazaki. It was established in 1475 by Matsudaira Chikatada. Daiju means Shogun in Chinese. It was built for the wish of Tokugawa Shogun. Daiju ji is the main temple for the Matsudaira clan that is the direct line of Tokugawa Clan. In 1535, 7th lord of Matsudaira, Kiyoyasu, also the grandfather of Tokugawa Ieyasu reconstructed all the buildings of this temple. There are monuments of all Tokugawa shoguns that have the actual height of them. Admission for the museum: 400 yen for adult, 200 yen for under junior high, free for kids. 1. use Aichi Kanjo Line to Daimon Station. Daiju-ji is Pureland Buddhism temple located in Okazaki, Aichi Prefecture. It is the main temple of all Matsudaira Clan and Tokugawa Clan. Therefore, inside of the temple, there are the memorial monuments of all Tokugawa Shogun that has the same height of each Shogun. There are many traditional buildings that are constructed in 16th century. Daijuji was established by Matsudaira Chikatada in 1475. The main script is made in the late 12th century. Daiju means Shogun in Chinese. It was named by the 4th Lord of Matsudaira to wish that Matsudaira clan will be Shogun in the future. Therefore, when Tokugawa Ieyasu, who is also the top of Matsudaira clan, became Shogun, he donated the main hall. 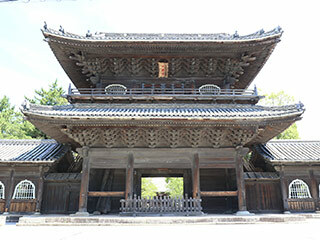 Also, his grandson, Iemitsu donated the main gate and bell tower. All of them except the main hall are still remaining in this temple. The oldest building is the Taho Tower that was constructed in 1535 by Matsudaira Kiyoyasu who is the grandfather of Ieyasu. When Tokugawa Ieyasu was 19 years old after the battle of Sekigahara, he escaped from Nobunaga and hid at this temple. Ieyasu was almost committed to Harakiri, but the priest of the temple gave him the word and he decided to live. At the same time, the monk of this temple fought for Ieyasu against Nobunaga and saved his life. After that, Ieyasu highly respected this temple as the temple of Tokugawa Clan.